Federal officials have slashed herring quotas and are considering even more draconian steps to reduce the catch. The small, silver fish that teem in large schools in the waters off New England are vital to the marine ecosystem, providing a crucial source of food to many of the region’s iconic species, including cod, striped bass, humpback whales, and seabirds such as puffins. But recent surveys have found that the Atlantic herring population in the Gulf of Maine is at risk of collapse, with so few being born that federal officials have slashed fishing quotas and are now considering even more draconian steps to reduce the catch. The proposed measures, which the New England Fishery Management Council is slated to take up on Tuesday, are so controversial that they have pitted fishermen against each other and have raised concerns about the future of the region’s lucrative lobster fishery, which mainly uses herring as bait. Last year, the region’s herring population dropped to an estimated 239,000 metric tons — a nearly 90 percent drop from the species’ peak in 1967, according to a stock assessment this year. 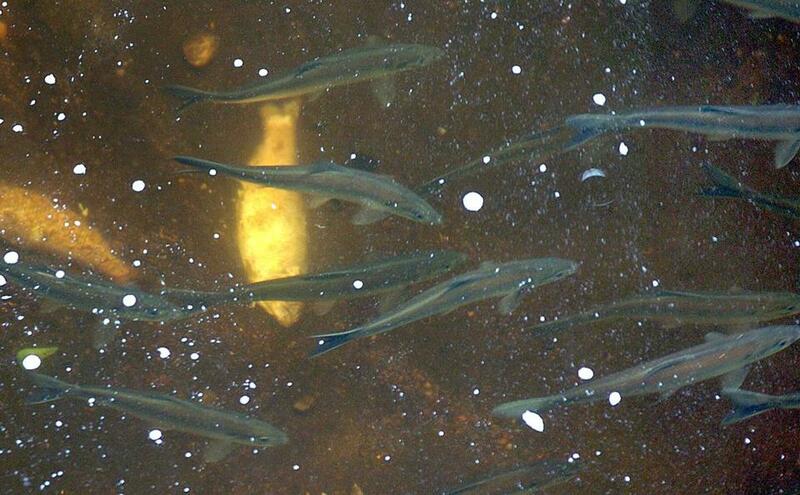 Even more concerning has been the decline in juvenile herring, those around a year old. The assessment estimated there were just 3.9 million juvenile herring last year, the second-lowest ever recorded. The record low was set in 2016, and four of the lowest estimates for juvenile herring have occurred since 2013. In 1971, by contrast, federal surveys estimated the region’s waters had 1.4 billion juvenile herring. The massive drop is considered dangerous to the species’ ability to repopulate. As a result, federal regulators earlier this year took the rare step of cutting this year’s herring quota by more than half. At their meeting in Plymouth, members of the fishery management council, which oversees the region’s fishing issues, are scheduled to vote on several measures that could substantially reduce the herring catch. Among them is a proposed buffer zone that would ban so-called midwater trawlers, which use nets as large as a football field, from fishing within 50 miles of shore, where herring tend to congregate. Another measure would change the formula that calculates how much herring can be caught, potentially banning the commercial catch altogether in the coming years. Environmental advocates, small-boat fishermen, and recreational fishermen have urged the council to impose more drastic options. “Midwater trawls have the capacity to remove enormous amounts of herring in these near-shore areas,” said Peter Baker, director of ocean conservation in the Northeast for Pew Charitable Trusts, an environmental advocacy group. He urged the council to authorize a 50-mile buffer zone. But owners of the trawlers, who contend the threat to herring has been exaggerated, say such measures would not only be unfair to them but do little to address the population decline. “A buffer zone doesn’t reduce the catch; it just reallocates who would get it, and the places the fish might be caught,” said Mary Beth Tooley, a spokeswoman for O’Hara Corp., a Maine-based owner of trawlers that fish for herring. She and others in the industry said they would support modest cuts to the catch. But other fishermen blamed the trawlers, saying they effectively scoop up nearly all the fish they target. He urged the council not only to ban trawlers from coming too close to shore but to set rules that would require them to leave more herring in the sea. His colleagues are already seeing fewer striped bass, which in increasing numbers are leaving their traditional feeding grounds along Cape Cod and moving farther offshore, beyond the reach of most recreational fishermen, he said. While overfishing is probably part of the reason for the decline in the herring population, the warming of the region’s waters could also be playing a role, scientists say. The Gulf of Maine has been warming faster than nearly any other body of water on the planet, and the warming has been linked to a precipitous drop in the region’s cod population, as well as in the lobster population south of Cape Cod. “Too much damage has already been done, and maintaining the status quo will result in disaster,” Martens said.